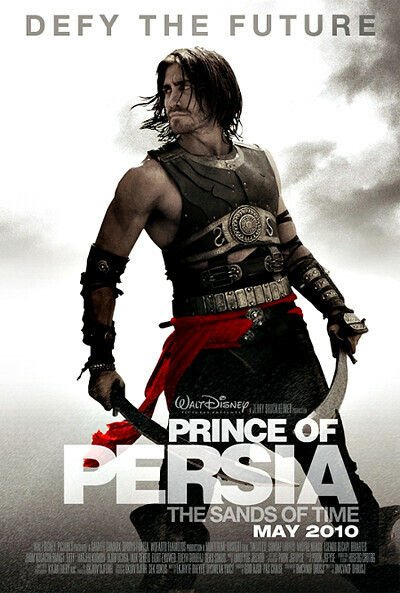 I’m sure everyone is talking about the Persian Prince by now. And tons of movie reviews about it has been blogged. But I just want to make mine quick and simple (with spoilers). *Note: If you haven’t watch the movie, you can read the original game synopsis but not my version of the movie synopsis. Passing through India en route to Azad, King Shahraman and his son, the Prince, conquer the Maharajah of India for honor and glory. After looting the city, they continue to Azad. In Azad, the Vizier of the Maharajah tricks the Prince into releasing the Sands of Time, using the Dagger of Time. The Sands infect everyone in the kingdom, turning them into monsters. The Prince, Princess Farah (the Maharajah’s daughter), and the Vizier remain unchanged due to their possessions: a dagger, a medallion, and a staff, respectively. On a journey to repair the damage he has caused, the Prince teams with Farah to return the Sands of Time to the hourglass, using the Dagger of Time. As time goes on, the Prince and Farah start to grow closer, to the point where she admits her love to the Prince while he was unconscious. After they make their way to the Hourglass of Time, the Prince hesitates, and the Vizier uses magic to throw him and Farah into a tomb. While in the tomb, the lights go out. Farah tells Prince of the word “kakolookiyam”, a word her mother taught her when she was little. The Prince awakens, and the Dagger and his weapon have been stolen by Farah, who left him with her medallion so that he would not be affected by the Sands of Time. The Prince pursues and catches her, but she falls to her death. Driven by grief, the Prince stabs the top of the hourglass with the Dagger of Time, locking the Sands of Time back into the hourglass, reversing the events of the game. The Prince awakens prior to the invasion of the Maharajah’s kingdom, and makes his way to Farah’s bedroom. He tells her a story about the events of the game, as she does not remember, but the Vizier shows up, and fights the Prince. The Prince emerges victorious and gives the Dagger of Time back to Farah. As he leaves, Farah asks what his name is. He responds by saying, “Kakolookiyam”, to prove that his story was true. They weren’t in India. Vizier? Who’s Vizier? But there’s a dude name Nizam who is the uncle to the prince. The babe is not Farah, but Princess Tamina instead (who?). No one turned into monsters. There wasn’t a medallion nor a staff. But you can see cool effect when the prince activates the Dagger of Time. Oh heck. The rest of the synopsis is totally different than the one from the game. And to have an ostrich race in the movie is kinda weird. Nevertheless, it was a cool movie to watch. Prince Dastan’s agility is very much similar to the game. Imagine seeing someone doing parkour in the desert around buildings and narrow passages. He even ran on walls to avoid being caught. So, in short, go watch the movie if you don’t mind it being slightly different from the game. But I’m sure you will enjoy it’s “new and different” storyline with awesome CG effects. Surely I will rate it as one of the best movies of 2010.